By referring your credit-disqualified clients to us, you transfer the complexities to our experts. You’re free to focus on current, closeable business while we help build your pipeline of future clients. Send an introduction email to your clients and cc us at info@b2cr.com. We will provide your clients free credit consultations with a step-by-step customized improvement plan. We will complete the necessary services to get your clients to their improvement goals. We will also share monthly updates so you can stay abreast of your client’s progress. We will refer your happy clients back to you so you can complete their desired loans – putting $ in your pocket! Nicole and Brent are the best in the business of repairing credit and supercharging fico scores….They are second to none…They have helped my mortgage clients boost their fico scores 50 to 100 points in a few short months for a very reasonable fee. Look nowhere else: they are the real McCoy’s …..All the other companies are pretenders and steal your money after making false promises….They will tell you exactly what needs to be done to boost your scores and/or fix your credit….Every single referral of mine has been happy with the outcome. The feedback I have gotten from my clients has been spectacular as well. This is essential for me because when I give out a referral, it’s my reputation hanging in the balance. I’ve never once been disappointed with the service or results they have achieved for my clients. bSquared Credit is the best!!!!! They got rid of all my derogatory marks within 45 days and my credit went up over 100 points! I would highly recommend them to anyone looking for a credit repair company. I know they won a lifetime customer out of me and I will be referring everyone I know who needs help with credit repair to them. Thanks, Brent, Nicole, and the team! Couldn’t be happier! I own a mortgage company, and this is the only credit repair company I recommend for my clients to use. Most credit repair companies are little more than a gimmick, designed to lock you in for a long-term and keep charging you monthly. bSquared Credit is the complete opposite! They will only charge clients for a shorter term, which gives them the incentive to get the job done quickly, which they do. Also, if a client doesn’t need their services, they don’t try to sell them anyway. Once again, they put the client’s needs first. Join our existing referral partners who are loan officers, Realtors, and financial advisors from a variety of companies around the US. we deliver exceptional results EVERY TIME! Why Partner with bSquared Credit? We’re an extension of your business! 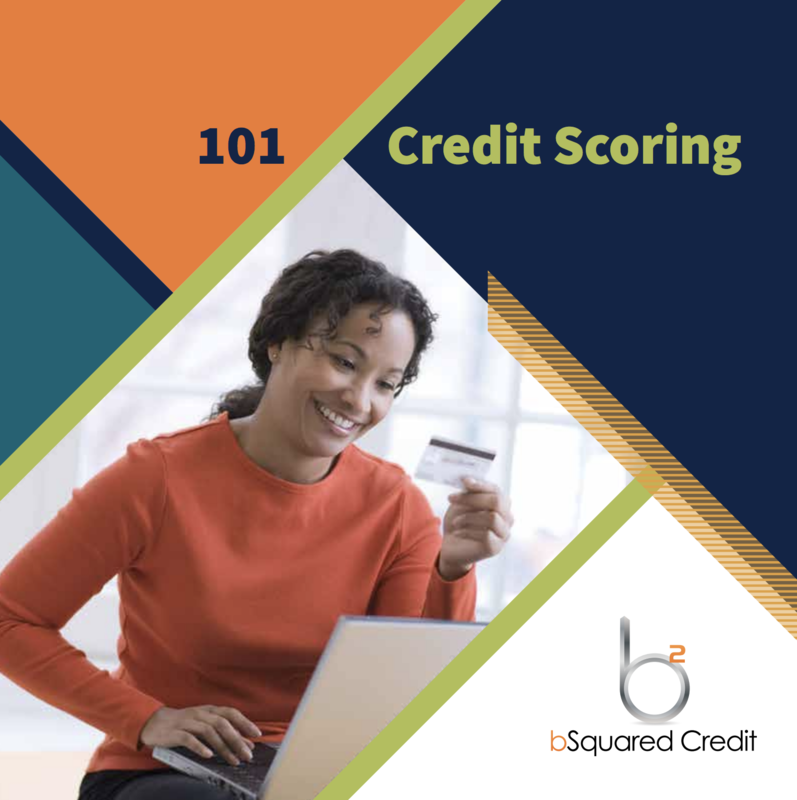 Learn Everything you Need to Know About Credit Scoring. Share it with your clients and partners too! We are not just a credit repair company; we are a credit consulting company. This distinction is core to our success and evident in the approach we take towards helping disqualified clients achieve their credit related goals. We work hard to earn your repeat referrals by being responsive, ethical, and effective. We will provide you estimated completion timelines and monthly progress reports so you’re prepared to move forward with the loan when the time is right. Our management team alone has more than 35 collective years of experience in credit scoring/ predictive analytics,debt settlement, loan underwriting, and fraud management. We are experts who truly understand how to resolve credit issues. Over the past 5+ years, we have perfected credit repair techniques and provide clients a credit education with our services that together, produce the best results. We consistently maintain the highest client satisfaction ratings around. Refer us a client today! bSquared Credit provides credit repair services to help clients attain financial freedom. Credit issues aren’t solved by one-size-fits-all solutions so we customize a unique step-by-step plan for each customer.